We are never truly alone, especially the witch. We are surrounded by the unseen and if we are smart we make friends with the unseen. We alone do not make the magic turn in our lives. It is through our allies and familiar spirits that the magic spins. Yes, we do have our own power to make things go, but when we include our familiar spirits in the work, it is by their hand through which that power is multiplied. 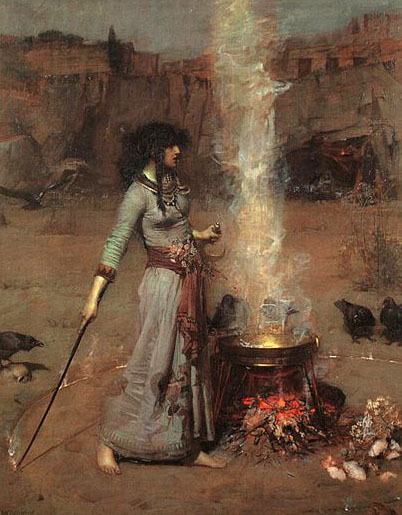 There are many accounts throughout history in which the witch speaks of a familiar spirit who “does her bidding.” I think that “doing her bidding” is probably the wrong turn of a phrase for the complicated nature of the relationship established between witch and familiar spirit. These friendships created are not ones of power over, they are of true power. Ones built upon mutual trust and respect: give and take. These relationships are not dependent upon being entrapped and forced into doing one’s bidding, these are beings who develop a caring and trusting bond with their companion and are willing to lend their hand to your work and out of mutual respect we pay them in kind with offerings that can only come from the human world and hand. While there are stories that tell of powerful witches and sorcerers that entrap and enslave spirits, but these spirits in the end either end up being set free by some big damn hero or they turn on said magic worker. That sounds like it can be a real nightmare, right? So why? Why work with familiar spirits instead of going right to the source of power, the Gods??? Well as you can imagine, if the Gods give you tools ( not to imply that familiar spirits are tools) and you refuse to use them do you think they are going to be willing to work with you any further? I wouldn’t think so. Yes, I work with Hekate and a host of Feri gods and goddesses. I honor them in turn and ask for inspiration to help me work through my situations. However, when the work at hand is to be done, I know that they have sent me allies who are more entwined in this world to help me accomplish the goals set forth. Yes, you will find that familiar spirits have their own goals and agendas, sometimes ones we can not understand and fathom. They are no less complicated and diverse in personality than we are. In fact, they may be more complicated seeing as how their understanding of life love and everything is from a very different perspective than our own. Does that make them dangerous? Well, I suppose if you were rude and unkind that very well could make them dangerous to you. However, as I said before, these relationships are built upon mutual respect. Are there spirits out there with whom you should not work. ABSOLUTELY! This is why trusting your intuition and gut is ever so important. Familiar spirits may indeed have their own agendas and goals, but by helping you with your tasks they may be doing what furthers their plans. You happen to be walking in the same direction with similar goals. They are on their own adventure, and helping you helps them. I am not entirely sure what it is about me that attracted the attention of some of my fine familiar friends, maybe there was just something shimmering and bright about me they liked. I’m past the days where I question how did I get such fine friends??? I am grateful to have them and that is that. I sing to them make them strange little gifts only they can appreciate, leave the offerings of honey milk ( and sometimes something boozy), draw them, call them and sometimes just fly out to hang with them while they have their own adventures. I am, however, very careful to never share their true names. Names are power after all. . . we all remember the story of Rumplestiltskin right??? Well, same goes for the familiar spirit. Turns out, that secrecy is also power, ask any politician. So how will you know you have a familiar spirit? You will know. It’s plain as day as to who they are and they are hanging in the background waiting for you to call them back. You have already been chosen, the choice to step up and work with them is yours and yours alone. They will not force you and if a spirit tries to force you, you now know they need to go. You do remember how to banish, right? So the next time you cast, and every time after that, I am now certain you will remember to say: It is not my hand that does this, but the hand of ( name your familiar spirit)! Give credit where credit is due. It’s a mark of not only respect, but a strong witch. And of course when someone later remarks, how did you do that?? The answer, of course, is a dutiful witchy smirk and a shrug. Secrecy is power. Prev The Devil made me do it!